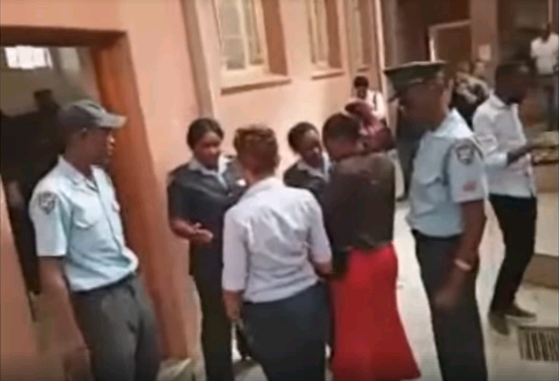 Video: Stringent security measures were implemented at the Windhoek Magistrate’s Court when City Centre shooter, Simataa Simasiku, made his first appearance on charges of murder and attempted murder. Additional and stringent security measures were implemented at the entrance to the Windhoek Magistrate’s Court when Simataa Simasiku made his much anticipated first appearance before a judge on charges of murder and attempted murder two days after a shooting incident that shocked the Namibian Nation to its core. 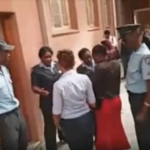 A heavy police presence was maintained and family members of Sarah Mwilima and Ester Nepolo, the two victims and other members of the public had to submit themselves to being searched before entering the courtroom due to the high level of public interest in the matter. When he arrived at the courtroom under heavy police guard, the calm demeanour of the self confessed murderer caused emotions to rise and several members of the late Sarah Mwilima could be seen weeping as Simasiku were ordered to take the take the stand. State Prosecutor Sylvia Kauluma informed the Court that Simataa faces charges of murder and attempted murder. She further informed the court that the State will oppose bail due to sever nature of the crime and the high level of public interest in the matter. Magistrate Vanessa Stanley informed Simasiku formally about the charges against him and also informed him about his rights with regards to bail and legal representation. Simataa informed the Court that he will attempt to obtain the services of a private lawyer. He added that if he is not successful with gaining the services of private legal counsel that he would then apply for legal aid from the State. Before postponing the matter to 1 March this year Magistrate Stanley informed the accused person that it is his right to bring a formal bail application before his next court appearance.